Gravity is a very important force to consider when dealing with biomechanics. It is constantly affecting the body in both static and dynamic movement. It can be looked at as the gravitational downward pull on an object. Whereas the center of mass is the mean position of matter in a body or system. Gravity, like all forces, has a point of application, a magnitude, and a direction. The point of application is the center of gravity or center of mass (COG or COM). This changes relative to how many segments are involved. For instance, the COG of the forearm alone will be different then the COG of the arm, forearm, and hand. The magnitude is dependent on the the orientation of the segment in space and is proportional to the mass of the involved segment. The direction of gravity is commonly referred the line of gravity (LOG). This direction is always vertically downward towards the center of the earth, regardless of the orientation of the segment/object to space. Gravity has a profound affect on biomechanics. 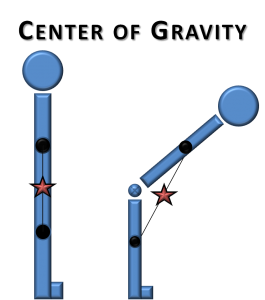 The gravitational force acts on the levers of the body to create torque at various body segments and joints. Thus, it encompasses almost all basic biomechanical concepts when acting on the human body. We use this knowledge of gravity and anatomy to manipulate muscle positions for manually grading muscle strength, movement analysis, and specific therapeutic interventions. The COG in the anatomical position is just anterior to the second sacral vertebrae. However, it’s important to note that COG/COM is conceptual. It is not a piece of anatomy; it is constantly changing with motion. With every movement and change of position the COG changes the way joints react and muscles perform. For example, the picture below shows the how the COG changes when the hip is flexed to 90°. This brings the COG anteriorly and creates a clockwise torque at the hip joint. To counteract this moment of torque created by the COG, the contralateral hip extensors must fire to keep the body statically erect. Change in COG and LOG with hip flexion. This results in change in muscle activity. Another consideration is that COG does not have to be a part of the body. Many exercises and movements cause the body’s COG to become displaced outside of the body. This would create an increase in the lever arm of the resistance force. Proper lifting mechanics are simply a means of decreasing this lever arm as much as possible. 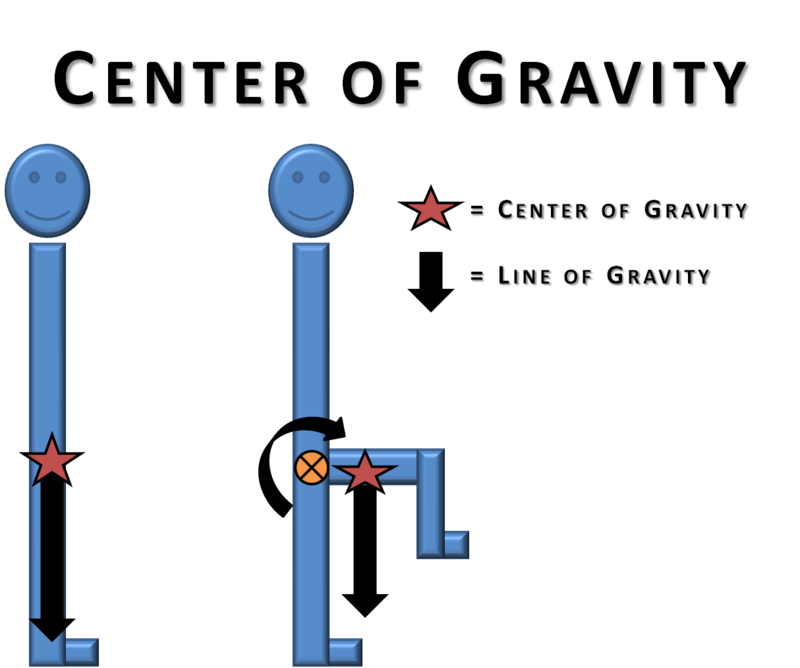 As seen the figure below, bending forward at the hip causes the COG to actually fall outside of the human body. Determining the COG and LOG is the beginning of understanding stability. For an object to have stability the LOG must fall within their base of support (BOS). This is rarely the case when it comes to human movement. Many times the LOG falls outside of the BOS and the body must counteract the subsequent torque and moment forces created by this unstable system to achieve functional stability. The concepts behind stability and functional stability are very detailed and very complex and will be discussed in a future post. Nonetheless, understanding basic biomechanics and how gravity affects the body will help to understand stability and balance. 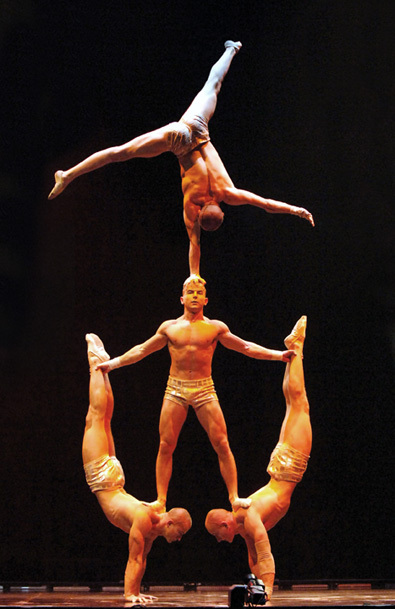 Cirque Du Soleil brings functional stability to a whole new level. You might need more than chin tucks to gain this type of cervical stability. Applying basic biomechanics to gravity will give a better understanding of how postures, movement, and exercises affect the body. A simple change in position of one extremity can cause a significant change in joint forces, muscle activation patterns, and neuromuscular coordination demands. Keep this in mind when assessing movements and implementing interventions.